In addition to worship and education, there are opportunities for people to get involved in the life of our faith community, and beyond. All women of Grace are invited to participate in monthly gatherings. LCW meets on the 2nd Monday of the month at 7:00 p.m. for Bible study and refreshments, September through May. LCW sponsors some Sunday fellowship times and provides support for youth camperships. All church women are invited to participate in the “Special Sister” Project, which randomly matches two women in the congregation to be special friends to each other throughout the year. A meaningful and fun annual event sponsored by the LCW is an Ecumenical Christmas party, to which all area women are invited. The LCW bible study for 2016-17 has not yet been selected. If you have ideas, contact Katie at the church office. People from both Grace and the Range community gather on the 1st and 3rd Wednesday of each month to make quilts for Lutheran World Relief (LWR) and to meet occasional local needs. 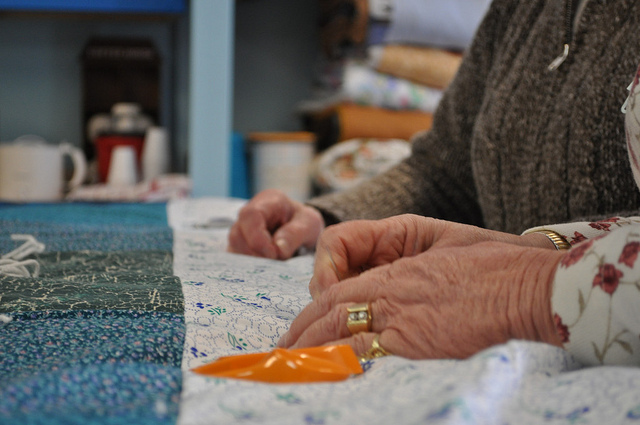 Although the quilters work diligently from 1:00 to 5:00 p.m. each time they gather, they also enjoy socializing with one another and occasionally have a meal together following quilting. Everyone is welcome to join in at any time. The most recent quilts made are on display in the worship area. To see pictures of the quilts, click here. In addition to making quilts for Lutheran World Relief, this group, with the assistance of the LCW and the entire congregation, also creates and packages a variety of kits that are sent around the world for people who need them. Donations of items for the kits may be made year round, and the kits are packaged and sent, along with the quilts, to LWR in October of each year. NOTE: the quilters often take a month-long break after the shipping has been completed. Click on this link for more specific information about the items need and how anyone can contribute to the LWR projects. This ministry is held at 1:00 pm every Tuesday, led by volunteer Sue Slinde. Whether you’ve been knitting for years or need to learn a new skill, everyone is welcome to stitch along with others making prayer shawls, wheelchair/walker bags, or another project that may be desired. Community members are encouraged to come for a time of busy hands and conversation. Bring needles, crochet hooks and yarn, if you have it. Patterns, tools, and yarn will also be available, and there is always coffee and tea. Our prayer chain has three strands of approximately ten people each. When prayer requests come to the church, the pastor, or one of the three leaders of the prayer chain, each leader ensures that it is passed along through their entire chain. This is a confidential prayer ministry that also offers complete anonymity if desired. To share a prayer request or to join a chain, contact Katie Bridgers in the church office or Alice Kohlemainen, Carolyn Rundman or Cheryl Stimac. A group of prayer chain members (and other prayer warriors) meet at 6:30 p.m.on the first Monday of each month to pray together in the worship space for about thirty minutes. Volunteer Carolyn Rundman calls those gathered to prayer by asking a blessing. This is followed by a ten minute time of silent prayer, before offering prayers aloud for the church, the world and those in need. This service ends with the group giving proclaiming the benediction to each other. Every Wednesday at 10:00 am, the coffee pot is on in the fellowship hall and there are often some goodies to munch as well. This offers a comfortable setting for anyone in the community to come together with others for a cup of coffee and a smattering of grace. All are welcome to participate whenever convenient. The lessons for the upcoming Sunday are discussed during a bible study every Wednesday at 11:00 a.m. Bring your own bible, or use one of the bibles provided. From worship leadership to home visitation; from counting the offerings to helping children with homework after school; from chairing a committee to washing dishes after a potluck, there is a place for you in our ministry. All members are asked to complete a spiritual gifts inventory as part of their annual stewardship commitment. Others involved with Grace may also be invited to identify and use their spiritual gifts in ministry, partnering with God to love and bless the world.